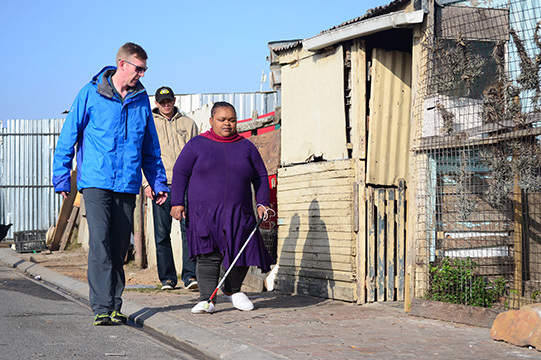 LOFOB is the only organisation of the blind in the Western Cape that offers the combination of independence development services of its nature. As a result, we receive many referrals of blind children and blind adults living outside of the Cape Town area. Towns visited in the West coast/Winelands area include Wellington, Wolseley, Tulbagh, Riebeek-West, Riebeek Kasteel, Porterville, Piketberg, Citrusdal, Clanwilliam, Klawer, Vanrhynsdorp, Lutzville, Vredendal, Saldanha Bay, Hopefield, Langebaan, Darling, Mamre. Also, day trips are regularly undertaken to areas that are not as further afield, such as Stellenbosch, Paarl, Atlantis, Strand, Gordon’s Bay. During these week-long Rural Outreach trips, LOFOB staff visit as many town clinics, community health centres, day hospitals, old age homes, and many client homes as possible. Basic skills' training is offered to blind adults. Basic handling principles including developmental milestones for blind infants are identified and how to achieve these milestones are discussed with parents/caregivers. Counselling is provided where necessary. Guidance regarding financial concerns, training options, schooling options, employment, assistive devices and other resources are provided. Supplying of essential assistive devices. Appropriate referrals are made where necessary.